It takes on whatever shape is most appealing. The origin of the mimic isn't completely certain, but the most popular theory is that a wizard did it. And with their track record, it's not exactly a slight chance that it could be true. At any rate, mimics currently roam free in the dungeons, tricking adventurers with their appealing shapes. If the mimic has an original shape, it hasn't been recorded. Perhaps they can only have the shape of a pre-existing thing. 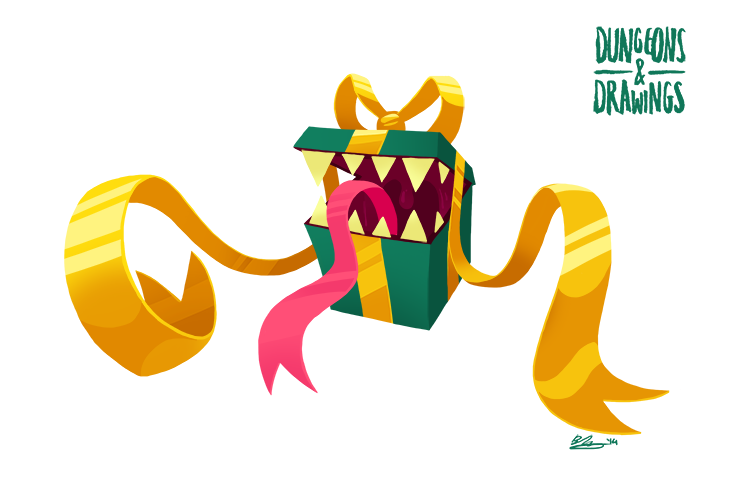 The mimic is a shapeshifter specializing in inanimate objects, and best known for looking like especially nice treasure chests that go on to sprout sticky limbs. But a mimic will gladly take on the shape of a larger object such as a door, part of a wall, and so on. Some of these monsters are massive enough to pose as houses. Watch out for huts that smell of saliva, is all I'm saying. The mimic or treasure-chest monster is pretty iconic across tabletop games and video games. I think the first game I ever encountered this sort of monster in was in Dragon Quest III on my Gameboy Color. It was a fun game. Hope you peeps are having some nice Winter holidays. Green Warders are cultivated by the elves of Faerûn to act as guardians of their most sacred places. 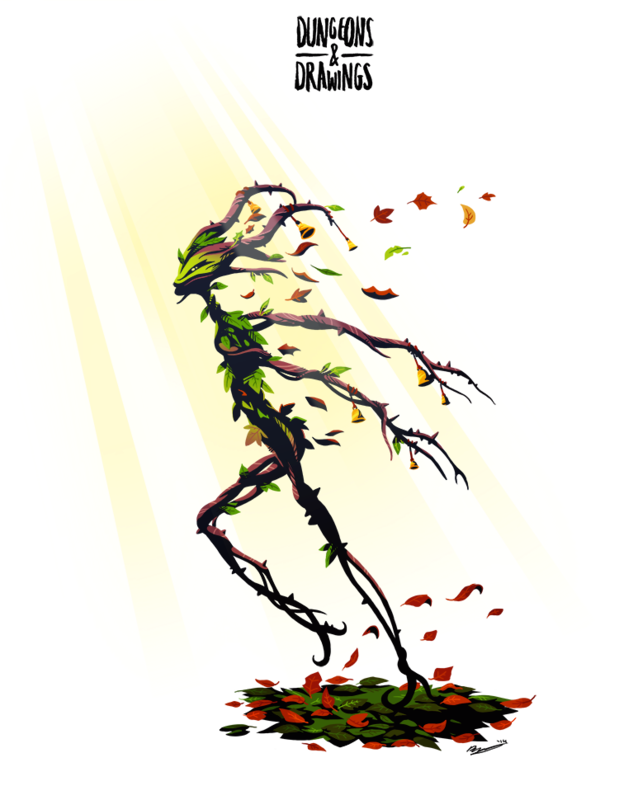 Despite this, a Warder is still a plant rather than a constuct, since constructs are normally made out of unliving material, while the Warders are still living plants. The Warder is not meant to be a combatant, but a decoy. Their branches and leaves are arranged in such a way so that it looks like an elf from a distance, causing any interlopers to either turn back or follow the fake. In addition to that, the Warder can cast several enchantments to either confuse or put intruders to sleep. When elves migrate from one area to another, they may leave the Warders behind, which will still carry out its duties. However, without the elves there to trim them regularly, the Warder grows shaggy with overgrown leaves and branches. I know horns aren't an especially elfy thing. Well, here's what I think about elves. I ain't like 'em. Or I specifically don't like those hippie frou-frou elves that are just so calm and intelligent and beautiful and blehhh. It's kind of why I prefer drow to ordinary elves, because at least drow have an interesting trait in their general awful evilness. In fantasy, I tend to find most elves to be a race of Mary Sues with maybe a little bit of condescension for the other races. 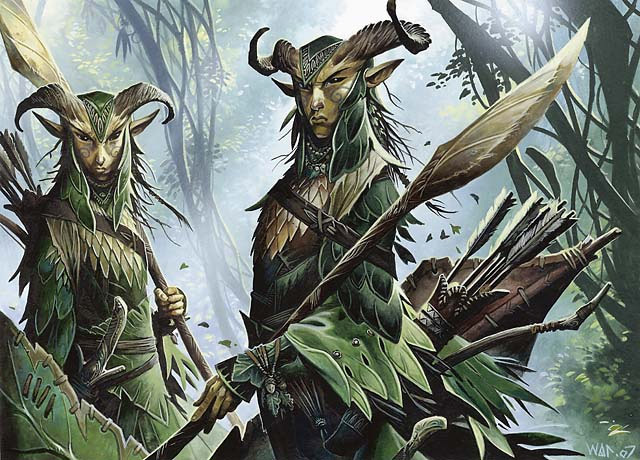 Which means that my favourite forest elves are the Lorwyn elves of Magic: The Gathering. They're a bit closer to Fair Folk, which is how I like my elves: self-obsessed, arrogant, dangerous and in tune with the more deadly aspects of plant-life. They loathe all other non-elf creatures (they call them eyeblights) and seek to enslave others at best or hunt them at worst. Also, they have horns. Which is why I gave the Green Warder horns. The Ravid is one of those jolly extradimensional creatures that are fairly harmless on their own plane but a good deal more chaotic when they cross over into ours. 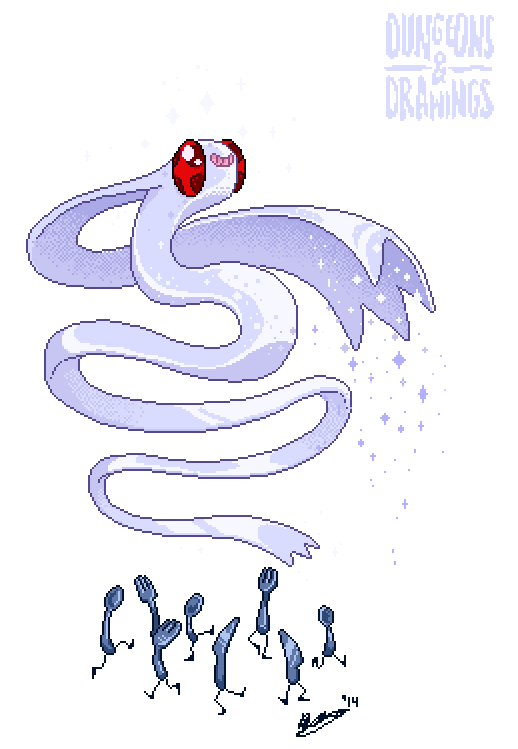 This particular creature comes from the Positive Energy plane, which you think would be good seeing as how positive energy is the kind of healing, undead-slaying magic you generally want on your side. Well too much positive energy is a negative thing it seems. Think of positive energy as air in a balloon; enough of it and you eventually go pop. But that's not the best weapon in the Ravid's arsenal. The best weapon would be that it can animate objects around it once every few seconds through the sheer force of the positive energy it exudes. The object chosen is completely at random, but it will still mess with your day. The fork is animated. Your sword is animated. Your clothes. The carpet, the table, the house you're in is animated. And all those objects are on the Ravid's side. This creature was a tricky one to redesign. 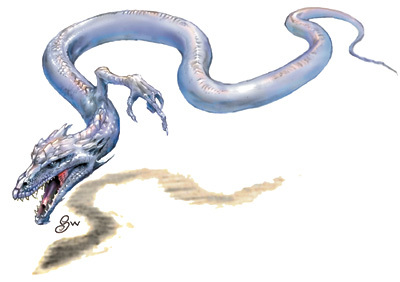 The whole pale glowing serpent thing was easy to do, but for some goofy reason it's described of having a claw that comes out from near its head. LOOK AT HOW GOOFY IT LOOKS. But while I guess giving it a long flowing tendril hair doodad with a hand-looking thing at the end looks less goofy, in a way it isn't as immediately memorable at the original Ravid's grumpy face and dorky little arm.